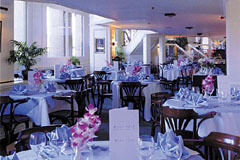 Elegant and modernistic in an unrivalled riverside setting - an epicurean delight in the very heart of London. Sophisticated, yet fresh and informal, with a spacious and bright galleried backdrop. Kwan Thai has an extensive a la carte menu, set menus, quick lunch menu, vegetarian menu, in fact a varied selection of menus to suit all occasions complemented by an international range of excellent wines, reasonably priced. “A cracking waterfront location, food, generous portions and superior service are catalysts behind this operation” – Square Meal Guide. Dine right on the river with the spectacular views of the city and Tower Bridge or order cocktails and canapes and sit back and relax while watching the sunset over the city. We and our staff take pride in our courteous and welcoming service. Our high standards are backed by the expertise of the thoroughly professional management team. For themed occasions - jazz, salsa, opera, Brazilian - over the years we have made many friends in the entertainment field and we would be happy to arrange the right atmosphere for your function. For business meetings, whether you use all or part of the venue, our conference organiser will ensure the success of your function, from your first enquiry through the planning stage, during the function itself and right up until the last guest leaves. Private rooms are available for working lunches and dinners. Stylish and modern, efficient for corporate entertainment. Open for lunch Mon-Fri 11.30am-3.00pm and dinner Mon-Sat 6.00-10.00pm. Closed Sundays and bank holidays. All major credit cards accepted. 12.5% service charge for parties over 7. Authentic Thai - arguably the best and most atmospheric restaurant in London. An international range of excellent wines, reasonably priced, and a range of cocktails. 3 set menus. Weekend buffet. Vegetarian menu.